Rowan Electric is a San Diego based, family owned electrical contractor for over 30 years. We continually strive to raise standards of professionalism, quality, and rock-solid leadership. Tradition, reputation and legacy are ingrained in the Rowan Electric Culture. Second generation electrical contractors, Paul and Mark Rowan formed Rowan Incorporated, a California Corporation, after being seasoned and trained by their electrical contractor dad, Paul B. Rowan. The corporation was founded on the principals that drove their father’s success: relationships, service and a high-quality product. Since 1998 Rowan Electric has realized steady growth. While maintaining its founding principles, Rowan Electric has added field personnel, staff and a service department who gladly service the needs of our valued clients. 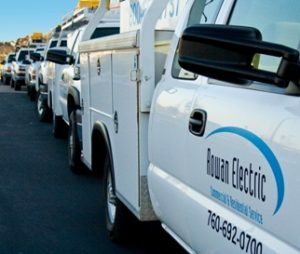 With both a service department (to handle specialty projects) and general construction, Rowan Electric is able to seamlessly service the simplest of needs to multi-million dollar contracts. 30 years in the electrical industry has allowed Rowan Electric’s key players to have experience in all aspects of the traditional electrical applications. Commercial, Industrial, Institutional, Warehousing and multi-family are all familiar territory – design/build or plan and specification. Adding to traditional electrical applications, our world has an ever-growing concern with energy conservation and use of renewable resources. Rowan Electric has extensive experience in design, development, and installation of energy conserving prototypical systems. Successful partnerships with our clients (general contractors and end users)have produced first-rate projects of nearly every type, including shopping centers, medical facilities, public and private education, hospitality, mixed use, commercial office buildings and tenant improvements. Contact any of us from Our Team page, or use our Contact Us page for general comments & questions.